Made plans to watch a movie at PVR Anupam? We say come a little early, or linger post your movie date because there’s plenty of other cool things that you shouldn’t miss out on in the complex. Missed your morning coffee and breakfast? No problem. Check out the all-brick-walls-and-yellow-lights cafe The Coffee Shop, a quaint place which serves some refreshing blends, teas and Super Food Smoothies. (There’s also delectable Italian cuisine on the menu that’s worth a try). You know when you’re not really in the mood to deal with unfamiliar options? The usual brands like McDonald’s, Pizza Hut, Burger King, KFC, Bikanervala and Subway pop up to your aid with their comfort food. There’s also Domino’s Pizza, which you can’t miss since it’s right next to the cinema hall. If they’re packed (which is a frequent event) there are plenty of other options as well. We’ll let you in on a secret – this complex has one of the city’s best Shawarma joints – Lebanese Point or Al Bake. There is also Aslam Tikka and Anand Curry Delite for juicy chicken and rolls. The downside, though, is that none of them have proper seating. If that doesn’t sit well with you, check out Moktoo (where you can have delicious momos) or grab some desi grub at Nukkadwala (their East India Burger is so good). If you want to buy second-hand books at dirt cheap prices, this complex has multiple stalls where you can pick a random novel, posters and coffee table books for as low as INR 100. Locale is a must-visit for its rustic interiors and a kickass view of the sunset, which you can enjoy while sipping on a Bailey’s Colada. 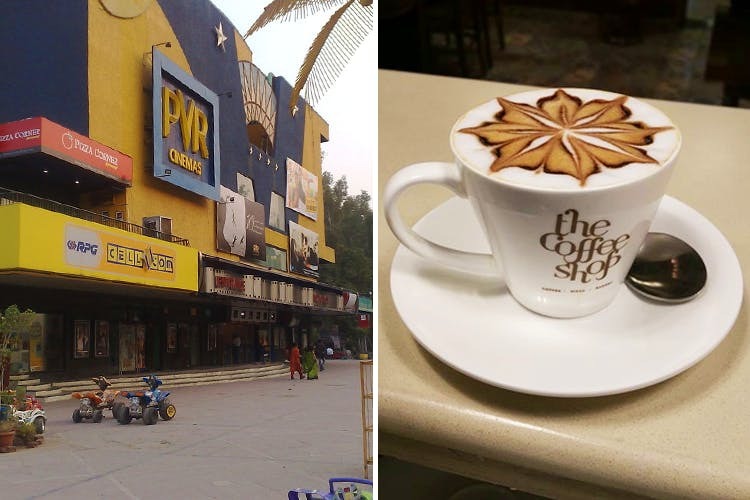 The Coffee Shop also serves wine and beer, but if you’re looking for a more lounge-like place where you can chill with your gang, visit Public Headquarter, which has a full bar, and is not too pricey (a pint of beer is just for INR 125! ).